Since February 2012 there is the most successful, 100% natural Ayurvedic Alopcia – Hair loss therapy available - now also in Europe. Dr. Rohit Shah is a founder of Alopecia Treatment Centre® and also known as a pioneer in the research of 100% natural and safe treatment options for different type of Alopecia - Hair loss. Alopecia Treatment Centre® has treated thousands of patients of Alopecia and has proved that herbal treatments are highly effective, harmless and 100% safe for hair loss problems. The team of Dr. Rohit's Alopecia Treatment Centre® consists of expert and experienced doctors from different specialities like Dermatologist, Trichologist, Homoeopath, Naturopath and Ayurveda. Dr Rohit is a Bachelor of Ayurveda and Naturopathy from Gujarat Ayurveda University, one of the best university of Ayurveda medical science on the earth. He is also known as a pioneer of herbal and natural treatments for Alopecia. Dr. Rohit's Herbal Treatment is based on Ayurveda and Naturopathy concepts which are India's traditional, natural system of medicine that has been practiced for more than 5,000 years. 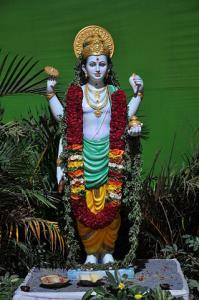 In ancient Ayurvedic tex Ayurveda is the traditional medicine of India, which originated there over 5,000 years ago. Ayu means "life" and Veda means "science." According to this translation, ayurveda means "the science of life. Widely regarded as the oldest form of healthcare in the world, Ayurveda is an intricate medical system that originated in India thousands of years ago. The fundamentals of Ayurveda can be found in Hindu scriptures called the Vedas the ancient Indian books of wisdom. The Rig Veda, which was written over 6,000 years ago, contains a series of prescriptions for different types of ailment. Ayurveda is based on the premise that the universe is made up of five elements: air, fire, water, earth and ether. 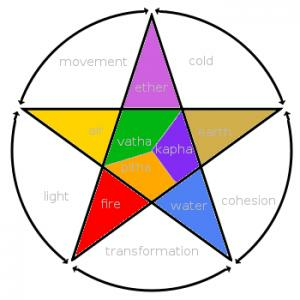 These elements are represented in humans by three "doshas", or energies: Vata, Pitta and Kapha. When any of the doshas accumulate in the body beyond the desirable limit, the body loses its balance. Every individual has a distinct balance, and our health and well-being depend on getting a right balance of the three doshas ("tridoshas"). Ayurveda suggests specific lifestyle and nutritional guidelines to help individuals reduce the excess dosha. A healthy person, as defined in Sushrut Samhita, one of the primary books on Ayurveda, is "he whose doshas are in balance, appetite is good, all tissues of the body and all natural urges are functioning properly, and whose mind, body and spirit are cheerful..."
Three terms are used to describe the symptom of hair loss, such as - Indralupta, Khalitya and Ruhya. When hair falls suddenly it is known as Indralupta [Alopecia areata] while Khalitya [balding] is a long running process of hair fall. Ruhya affects the entire body [Alopecia universalis]. There are many natural treatment options mentioned in Ayurveda books. Using this phenomena Dr. Rohit's Alopecia Treatment Centre® has successfully treated thousands of patients from all over the world which has proved natural treatment can be the best option to cope up with Hair Loss - Alopecia. Losing hair can be a traumatic experience especially when there is no reason found. Conventional allopathic treatment has very limited option to fight with alopecia and people are dissapointed and fed up with side effects with such treatments. Alopecia' is a medical terminology which is being used for various types of hair loss like: Androgenic alopecia, Alopecia areata, Cicatricial alopecia, Trichotillomania, Traction alopecia etc. But among all, Alopecia areata is a highly unpredictable, autoimmune skin disease resulting in the loss of hair on the scalp and elsewhere on the body. It's not yet perfectly known what causes Alopecia areata. For some reason, follicles stop producing visible hair, resulting in smooth bald patches that can appear overnight. Researchers are trying to determine what triggers the disease, and whether it's within the body or from environmental factors. 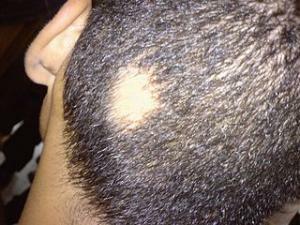 There are no symptoms before bald patches appear, and no diagnostic tests. However, there may be some hereditary factors. About 20% of people with alopecia areata have a family member who is also affected. Atopy, a genetic condition that predisposes people to hay fever, eczema, asthma and other autoimmune diseases, is often associated with Alopecia areata. Perfect etiology of Alopecia areata is still not known. Medical science believes that the affected hair follicles are mistakenly attacked by a person's own immune system's #white blood cells#, resulting in the cessation of the hair growth stage. Alopecia areata usually starts with one or more small, round, smooth bald patches on the scalp and can progress to total scalp hair loss known as Alopecia totalis or complete body hair loss known as Alopecia universalis. There is no FDA approved oral medicine or pill available as a 100% cure for Alopecia areata. Most of the oral medicines available in the market are Placebo Products. Here is a list of few common factors which are known as a trigger for Alopecia areata: • Genetic tendencies • Environmental triggers • Medicines • long illness • Exposure to chemicals • Nutritional deficiency • problems with Thyroid • Extreme Stress • Vaccines • Local skin disease • Pregnancy and Hormonal imballance. Following are disadvatages of that method: •Systemic or topical steroids have been found to have only partial success in the control of Alopecia areata • Systemic steroids only suppress the underlying conditions and do not alter the course of the process •Unfavorable side effects of the steroid do not permit prolonged use and once they are discontinued, a relapse of the disease occurs • Steroid dependability • Temporary depression of the skin • High recurrence rate • Topical Immunotherapy is proved very uncomfortable treatment and not a permanent cure for Alopecia patients. In a contrast to Western conventional medicine dr. Rohit has opted for a therapy, which does not contain any synthetic drugs, no side effects, the results are successful also in 95% of cases (depending on the cause of the hair loss ) - which has not been achieved by anyone so far! No known method, institution or product, have not had such success. There are over 100 people from around the world calling, emailing or visting his centre daily, because the success of the theraphy and the fact that there is no side-effects is widely known and rapidly expanding. Dr Rohit’s Herbal Treatment contains herbal oil, herbal powder ,herbal paste and herbal gel. Treatment does not contain any oral pills. Products are prepared according to the history given by the patient and it is prepared at registered pharmacy under strict norms of Ayurveda. Applications are so convenient that anyone can use it at home. The mode of application do not disturb office hours . Products are to be applied at night and wash off in the morning. The products do not contain any perfume, fragrance or colors. It has natural smell. Dr. Rohit's Alopecia Herbal Treatment is – as mentioned above – based on ancient Ayurveda books. It contains different Ayurveda oils and fresh herbs.The advantages of herbal therapy are several – among them: •No oral medicines •No side effects •100% safe and potential compare to other therapy •No depression or scarring of the scalp skin •Low recurrence rate •No dependability. It contains different Ayurveda oils and fresh herbs.• Different Ayurveda herbs• Herbal extracts• Herbal Paste• Herbal oils. Dr. Rohit's Alopecia Treatment Centre® prepares a customized topical herbal formula for different types of alopecia like Alopecia Areata, Androgenic Alopecia, Cicatricial Alopecia, Telogen Effluvium, Trichotillomania, Chemotherapy and Hair loss etc. It also uses the modern aspects and latest technologies for the best clinical outcome and their commitment is to provide 100% safe and natural treatment options for hair loss patients. The founder of the European centre, based in Slovenia, Dr. Špela Šeme and manager of the Centre, Robin Šuc recently obtained all the necessary licenses and education, which is necessary for the proper diagnosis. Therefore, you don't need to go / phone or send email's to dr. Rohit. The cost of the entire online and phone counselling , diagnosing, opening of the Registration form at dr. Rohit, the Ayurvedic package for first 6 months of therapy ( including postage via Express International courier service from India ) and after the sale service is extremely affordable as it cost only € 330! Therefore, personall consultation can be done in licensed European centre in Kranj or you can appoint a phone counselling or you can reach us by the e-mail as well. The staff instructs you about the treatment and sends all necessary informations. The cost for addional 6 months are € 250. You can simply send us email with photos of the results obtained so far, dr. Rohit diganoses the pictures, gives his evaluation of the progress and we order the next pack. The first successes can be seen as fast as in 3-4 months, as the hair needs that time to be restored ( growth cycle ). Basic therapy lasts 6 months. Duration of the treatment depends on each individual, since each patient responds differently (this is known in Ayurveda as Prakruti). To treat milder, the first pop-up forms of Alopecia areata it usually takes just 12 to 18 months, while at extended circular forms of Alopecia it can be as long as 36 months of treatment. For the treatment of Alopecia areata where there is area of the affected of the scalp larger than 50% then the process of treatment may be longer. Therapy is very successful at stopping of child hairloss, men and women Alopecia,pattern baldness, falling out of hair as a result of hormonal imbalances after the childbirth and after the chemotherapy. In the case of the latter's hair grows back quicker and they also grow back – even if the process of the growth has been stopped. You are also wellcome to visit the internet page of dr. Rohit at hppt://www.alopeciacure.com .